Keep in touch with the latest 1C Entertainment news on our website and by following us on Twitter and Facebook. PRAGUE, September 6, 2018 – “Soon you will have all the answers to your questions. 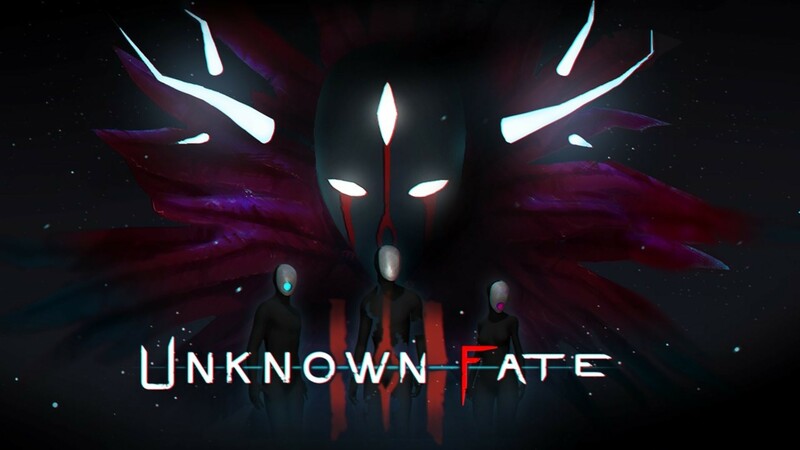 But you still have so much to see…” 1C Company, a global PC and console games publisher, today announced that the story-driven action adventure, Unknown Fate, has launched for PC and PC VR on Steam for $12.75, a 15% launch discount off the game’s normal $14.99 MSRP. At launch, the game supports HTC VIVE and non-VR PC gameplay, with Oculus Rift support coming via update. Keep in touch with the latest 1C Company news on our website and by following us on Twitter and Facebook. • Deep Class System: Over 20 classes and 200 abilities lets you truly customize every one of your characters through the selection of their class, sub-class, and passives to create a versatile generalist, a dedicated spell-caster, or a mighty foe-crushing specialist! 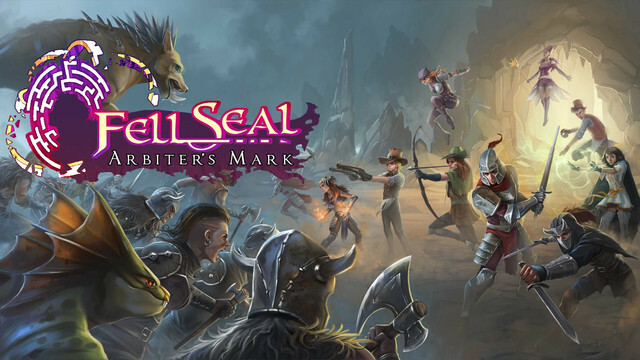 Fell Seal: Arbiter’s Mark is developed by 6 Eyes Studio and published by 1C Company. The game has been rated TEEN with violence, blood, and mild language by the ESRB. The game is now available for PC via Steam Early Access for $19.99. ourKeep in touch with the latest 1C Company news on their website and by following us on Twitter and Facebook. 6 Eyes Studio is an independent game studio established in 2015 by the happily-married couple Pierre Leclerc (programmer) and Christina Leclerc (pixel artist). They had previously worked in the video game and tabletop industries (EA, Activision, Gameloft, Topps Digital, Judges Guild, Studio Archcraft, etc.) for about 15 years. After many years of planning their first title, Fell Seal: Arbiter's Mark, the time was finally ripe in 2015 and they officially started work on the title. The studio's goal is simple: to create fun and engaging titles by marrying modern design strategies with time-tested classic gameplay, and to do so using modern and vibrant 2D art. Ancestors Legacy adds Heroes to the multiplayer mode and invites all strategy masters out there to take part in the upcoming tournament! The brand new Ancestors Legacy update brings Heroes - units well known from single player missions, to multiplayer campaign, giving it a fresh spin. All gamers are invited to test it and then sign up for a tournament organized with AMD™ and The Overpowered Noobs. PRAGUE, Czech Republic, 31 July 2018 - If you’re a strategy games’ fan, then by now, you probably know Ancestors Legacy - a history-inspired real-time strategy game influenced by historical events in the Middle Ages, by heart. If that’s the case, then Destructive Creations and 1C have a real treat for you. The brand-new update make Heroes join the multiplayer campaign, changing it significantly and making it even more exciting! 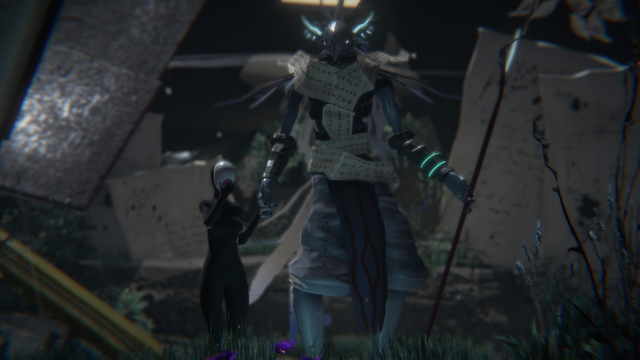 You can download the latest update from Steam (https://store.steampowered.com/app/620590/Ancestors_Legacy/) and we highly recommend doing so especially if you plan to take part in the next tournament. You can be sure that your opponents will come prepared and will know exactly how to use the Heroes to their advantage. Haven’t registered for the tournament yet? No worries, you still have time as epic battles will start on August 25th. 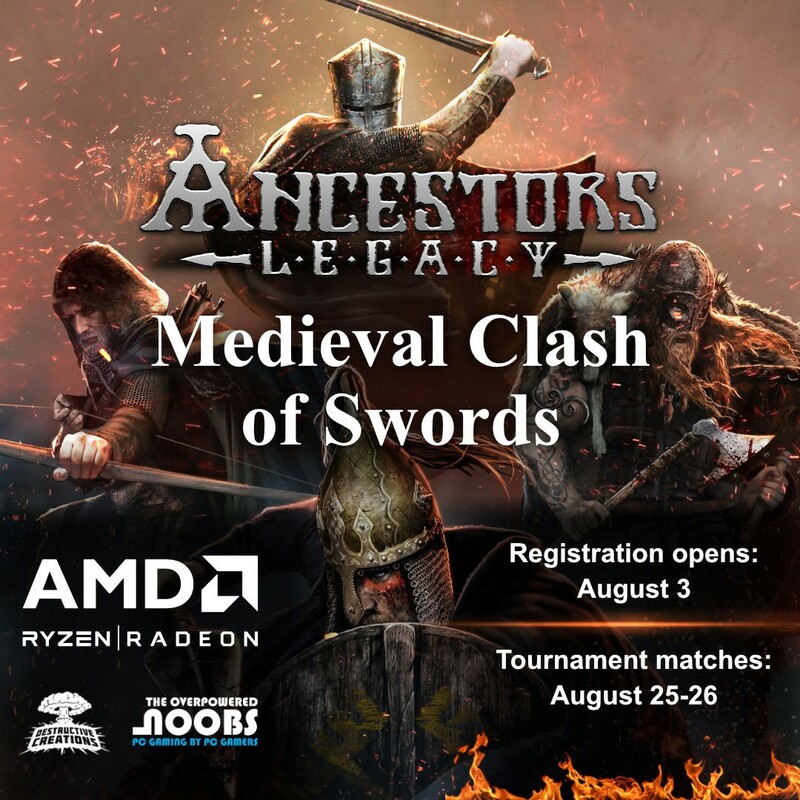 Follow this link: https://goo.gl/kPxwA7 for all the details and apply today for a chance to win your very own, powerful AMD Ryzen CPU or Ancestors Legacy Collector’s Edition! And if competing on-line is not your thing, but you enjoy watching epic battles, then we’ve got you covered as well, as the whole event will be streamed live here: https://www.twitch.tv/opnoobsonline. Alright! Now let’s take a closer look at how exactly do Heroes impact the multiplayer fun in Ancestors Legacy. Heroes are squads containing of a single pawn, which doesn’t have a morale bar, and so, doesn’t suffer from morale loss. On the other hand, Heroes have special aura indicated by big blue circle around them, which, once players' food drop to zero, prevents other squads morale loss from hunger. Heroes cannot be replenished or re-recruited when they die. • Holy Fury - for a short period of time target’s defense is significantly decreased. • Redemption - removes any debuffs and boosts offense, defense and damage. • Heavy Blow - temporarily increases attack and damage. • Raise Shields - squad raises their shields to hide from enemy arrows. • Chase - temporarily increased movement speed in exchange for lower attack and defense. • Sharpshooting - Dunstan gets into sharpshooting mode, increasing his sight distance and shooting speed. • Holy Fury - for a short period of time targets defense is significantly decreased. • The thrill of Victory - boosts morale of all nearby units. If you’re going to Gamescom you will also be able to check out the game and the latest update, in 1C booth located in the Entertainment Area, Hall 10.1 Aisle D, boot number 92. 1C Company, a global PC and console games publisher, has today announced that its substantial bags are packed to the brim for Gamescom 2018, where a huge variety of new games in its rapidly burgeoning catalogue will be on show. The consumer booth will be hosted by venerable MMA champ Andreas “Big Daddy” Kraniotakes, who will be presenting competitions and activities for everyone to get involved in and awesome prizes will be on offer. Gamers will also be able to get their hands on a wide variety of newly-signed titles set to be available in the coming months, all powered by the latest tech from ASUS ROG & BoostBox Powered by ASUS PC systems, the official Gamescom 2018 hardware partner. 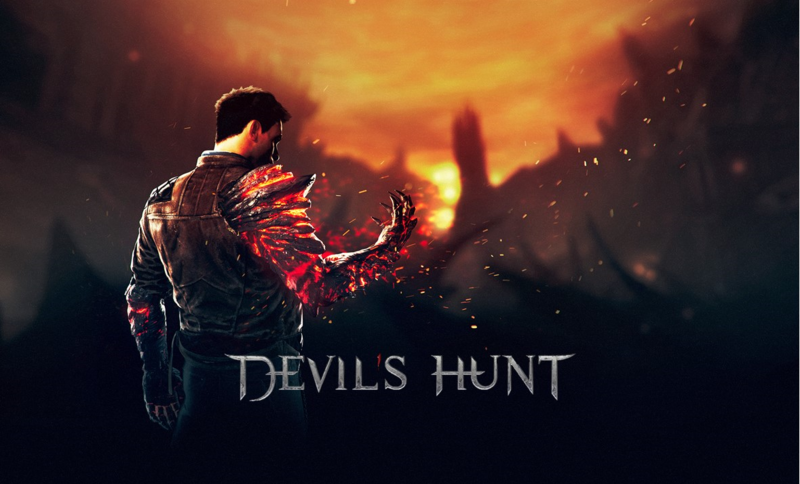 The recently announced Devil’s Hunt features a captivating storyline based on the original novel Equilibrium by Paweł Leśniak and has players take the role of Desmond, a man with demonic powers forced to choose a side in an apocalyptic battle between heaven and hell. The new trailer is available now, featuring slick visuals, stunning environments and epic third-person melee action. 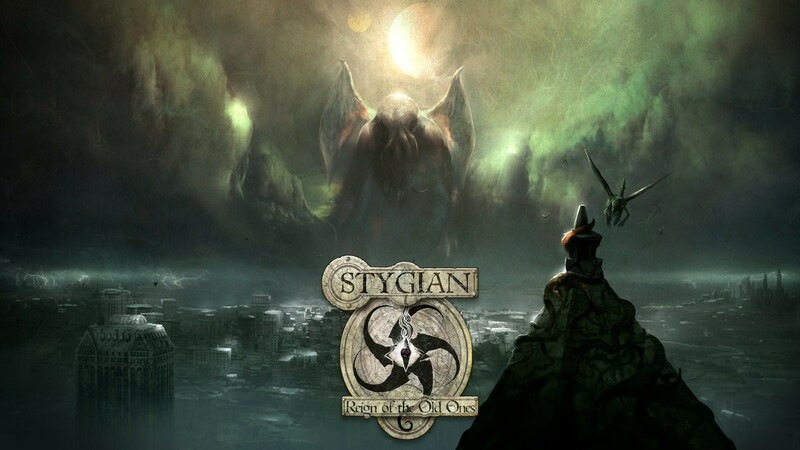 Stygian: Reign of the Old Ones is a roleplaying game of horror, loss, and madness set in the strange worlds of HP Lovecraft. Players will journey through beautiful, dreadful hand-drawn environments and push their sanity to the limits in facing unknowable horrors and engaging in tactical, turn-based combat. See the new gameplay trailer here! Deep Sky Derelicts is a strategic turn-based RPG set in a distant future in which the near boundless galactic travel is matched in scale only by the wealth disparity in society. Featuring rogue-like elements and tactical card combat, players must take control of a squad of mercenaries in a unique sci-fi comic book world. Ancestors Legacy brings the blood and brutality of eastern European medieval combat to consoles after a successful PC release. With a strong focus on tactics, players are tasked with controlling one of four nations – Viking, Anglo-Saxon, German or Slav – and tearing through Europe on differing conquests, featuring an intense multiplayer mode and outstanding visual fidelity. Fell Seal: Arbiter's Mark is a turn-based tactical RPG with a focus on storytelling, set in a fantastical world with a touch of steampunk. Featuring a complex class system and unique customization options, players will take control of Arbiter Kyrie who will lead troops through a detailed world on a quest to rid the world of deepening corruption. Gift of Parthax is a 2D top-down arena fighter in a gothic pixel art style, following the story of Arif, a mage on a quest to save his friend and in doing so must battle waves of enemies and bosses in Atixa’s grand arena... You can check out the new trailer here! 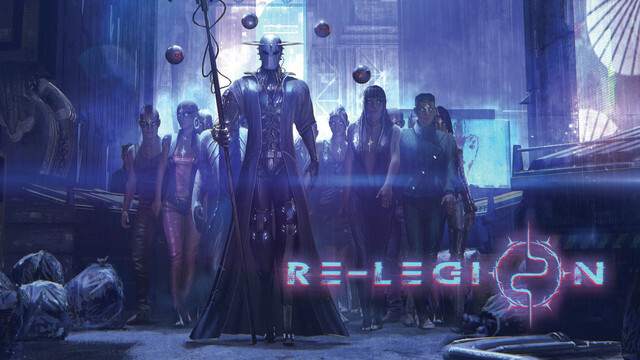 Re-Legion portrays a stunning cyberpunk world in which technocratic perfection has given birth to a sinister cult. Introducing a new alternative to the usual economic and resource management used in RTS games, the game allows players to convert ordinary non-believing citizens into their units – the followers. 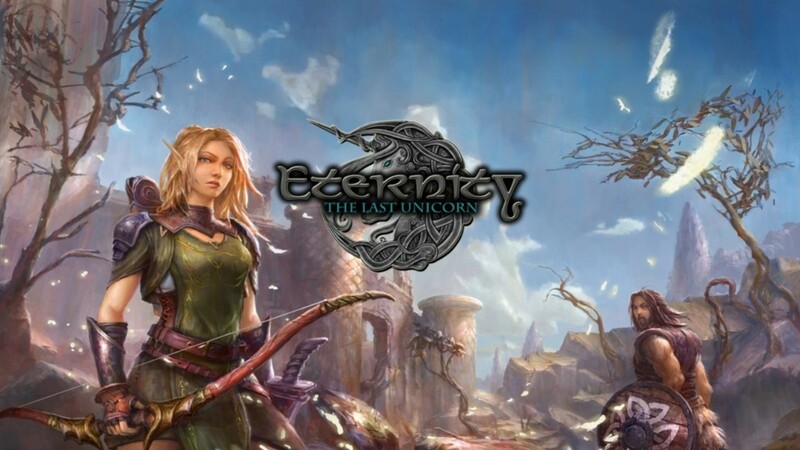 Eternity – The Last Unicorn was inspired by tales from Norse Mythology and the mechanics of classic games, resulting in a unique action RPG. 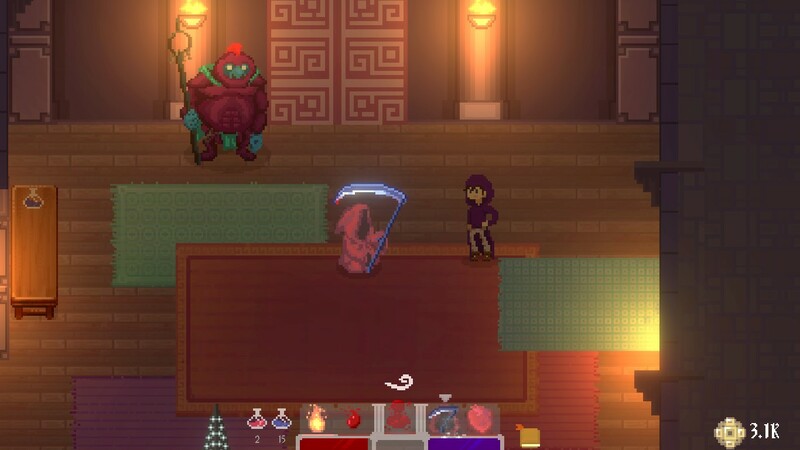 Blending an awesome visual style and a unique setting, players will enter an in-depth world on a quest to find Eternity. 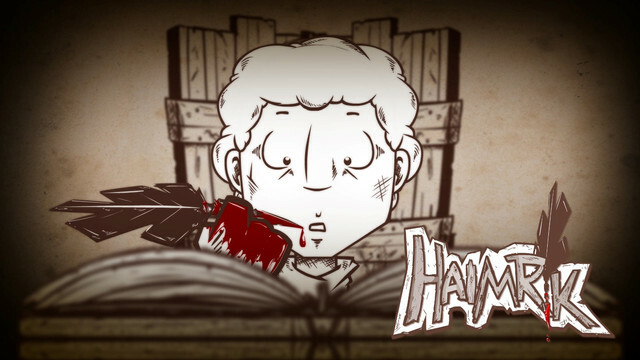 Haimrik is a darkly comic action adventure game, following the gory tale of a young scribe trying to make a living in a medieval town full of warriors, sorcerers, dragons and dragon-riding sorcerer-warriors. 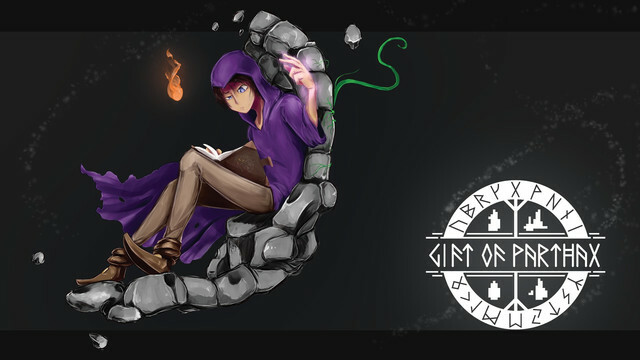 Haimrik will command the power of words on his quest to hilariously and brutally take down his enemies in a hand-scribbled world. 1C Company will also have an even more extensive selection of games in the Gamescom business halls for media and influencers to gain more insight into 1C’s extensive upcoming catalogue. To book a media appointment, please email 1CPublishing@premiercomms.com. 1C has recently released HAIMRIK, ANCESTORS LEGACY, QUANTUM REPLICA, THE WATCHMAKER, REALPOLITIKS: NEW POWER, REALPOLITIKS, FALL OF LIGHT. 1C announces today the opening of new opportunities for players of Ancestors Legacy, the studio’s recently released squad-based RTS, inspired by historical events. By unlocking parts of the game’s code, the developers have opened up a new way for integration of specific tools and features. Developed with Overwolf, the released official SDK enables programmers and motivated players to conceptualize and develop overlay apps that will help both newcomers and advanced gamers to play and enjoy the game in new ways. These fresh tools can expand a player’s capabilities and make their experience with Ancestors Legacy a more enjoyable one by introducing the required external tools and services right into the game. Whether it is real-time event tracking, post-game analytics, self-coaching tools or social features, with Overwolf you can create it and make it a part of your Ancestors Legacy experience. Overwolf's mission is improving competitive gaming experiences for gamers worldwide through useful, effective in-game apps and tools. 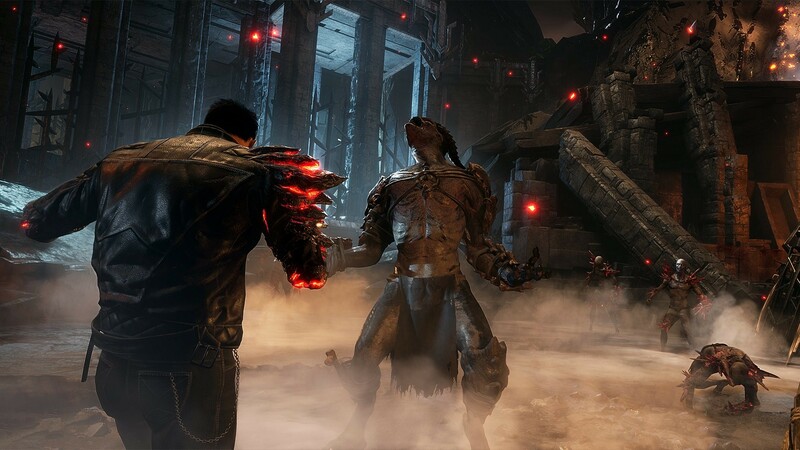 The Overwolf client enables fans and publishers to add functionality to existing games, and allows players to easily select, install and use hundreds of applications and in-game tools improving player communications, user interface, and most importantly - competitive performance and straight-up skills. Working with developers, Overwolf enables new game features and overlays which 'should always have been there' to be implemented effectively and swiftly, bringing new value to millions of players. Overwolf's partners include OP.GG, NVIDIA, Cloud9, Team Liquid, CLG, Riot Games, Logitech and many others. For more information, visit Overwolf. Destructive Creations is a very experienced development team, comprised of highly-skilled game industry veterans. Many years of common creative work has led to a super smooth workflow and team stability. Our first production under the Destructive Creations brand was Hatred, which was released on June 1st, 2015. Our main goal has always been to create original, uncompromising games. The example of Hatredshows that we can handle controversy and unusual solutions perfectly. 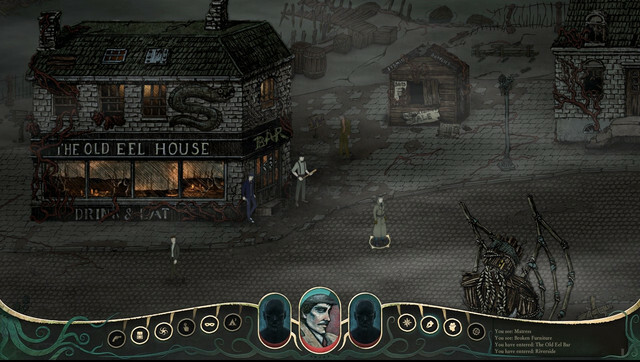 Layopi Games is Warsaw game studio founded by Paweł Leśniak - a promising writer of the young generation. The studio focuses on creating high quality video games using various hardware platforms like PC, PS4, XBOX ONE. Our target is to deliver outstanding story-driven games with high-end graphic, sound design, and innovative gameplay solutions. Right now the studio is home to more than 40 talented artist, programmers, and designers.